We’d love your help. Let us know what’s wrong with this preview of Armageddon Sky by L.A. Graf. All Klingons revere the Day of Honor, their most sacred holiday, but the true nature of honor can be a matter worth fighting over... Dispatched on a secret mission to investigate the raids, Commander Worf of Deep Space Nine and the crew of the Defiant find themselves trapped on a an alien world threatened by global cataclysm-- trapped along with Klingons who were exiled to All Klingons revere the Day of Honor, their most sacred holiday, but the true nature of honor can be a matter worth fighting over... 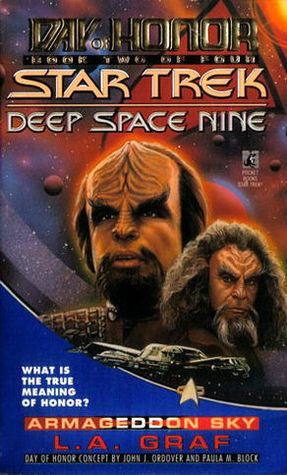 Dispatched on a secret mission to investigate the raids, Commander Worf of Deep Space Nine and the crew of the Defiant find themselves trapped on a an alien world threatened by global cataclysm-- trapped along with Klingons who were exiled to this world for their loyalty to Worf's dishonored family. To ask other readers questions about Armageddon Sky, please sign up. Comets, Klingons and Cardassians, oh my! There's plenty of each in this book as what starts off as a sightseeing expedition to watch a cometary event, turns into a conflict over a remote seemingly unimportant planet. On this adventure are also plenty of new aliens, the banchory and xirri, and, most importantly, the main DS9 crew. Right off, I found the relationships between members of the DS9 crew to be one of the books' strengths. L.A. Graf brought little idiosyncrasies between characters I've e Comets, Klingons and Cardassians, oh my! Right off, I found the relationships between members of the DS9 crew to be one of the books' strengths. L.A. Graf brought little idiosyncrasies between characters I've enjoyed from the show convincingly to the book, which really added to my enjoyment. One of the highlights include when Dax blows a kiss at Worf causing him to turn away in discomfort. I couldn't help but laugh when I came to this scene and thought it captured the relationship between them perfectly. I also really enjoyed his depiction of Sisko's command style. On a few occasions before making a big decision, he shows us how Sisko does a "round table" to get the opinions of the rest of his crew before making a final decision on something. These scenes are really good examples of how well the DS9 crew work together and how good a Captain Sisko is. There was a fair amount of technobabble in this story, but that's an aspect of Star Trek and other Science Fiction shows I've enjoyed since I was a kid. As a non-scientist, I can't attest to it's accuracy, but including stuff like that makes the story more believable when it's well done, as it was here. I can attest to the accuracy of one thing, that is the depiction of Bashir's use of the tricorder to translate what the Xirri's language. In this scene, the translation the tricorder gives often includes a couple of alternative English words that express what the Xirri is trying to say. As someone who has worked extensively in other languages, it was really cool to see Graf show us the that translation can be complex and difficult and can rarely be done word for word. The Xirri make their sole Star Trek appearance here, which is too bad. They were an interesting species and I'd like to see them make another appearance! Now to one of the book's big problems. There are WAY too many characters for such a short read and Graf doesn't really focus on any of them. I found this a bit annoying and it took me out of the narrative a couple of times as I tried to remember who did what and keep track of the story through the haze of this seeming infinity of characters. The story would have been much more engaging if Graf had focused on one or two characters (a la "War Drums", which I reviewed a while back which was very much Worf's story). As is, there's so many it's difficult to keep track of all of them and, aside from the ds9 crew, none are developed enough to make much of an impression. Overall, however, I did have a lot of fun with this one and would definitely recommend it to any fan of Star Trek or DS9. The Klingons are one of the core races in the Star Trek universe and also one of my least favourites, which is a shame as they crop up all over the place. The ‘Day of Honor’ series of books all concentrated on the one day of the year that Klingons are meant to respect the honour of their enemies. The unfortunate thing about Klingon honour is that it seems to be used to do pretty much anything; it was honourable to murder them all could easily be it was honourable not to murder them all. Some of The Klingons are one of the core races in the Star Trek universe and also one of my least favourites, which is a shame as they crop up all over the place. The ‘Day of Honor’ series of books all concentrated on the one day of the year that Klingons are meant to respect the honour of their enemies. The unfortunate thing about Klingon honour is that it seems to be used to do pretty much anything; it was honourable to murder them all could easily be it was honourable not to murder them all. Some of the books in the ‘Honor’ series have been fun science fiction thrillers, but ‘Armageddon Sky’ by L.A. Graf highlights what can be wrong with the Klingons. The books starts off at a pace and does not stop. The vast majority of important crew from Deep Space Nine have set off on the Defiant to investigate some Klingons trapped on a planet that looks like it is about be destroyed. With a Klingon ship in orbit preventing any people from being beamed off the planet, can the crew help planet side? Also, can they deal with the frankly ridiculous nature of Klingon honour that means the people trapped are seemingly happy to die? I have been impressed with how many of the ‘Honor’ books have managed to make Klingons actually make sense, but Graf fails and instead falls into all the traps that make them one of my least favourite Star Trek races. Their stubbornness for honour can often just be stupid. The trapped clan would rather die than make some simple effort to save themselves. Rather than follow the Prime Directive and leave them to kill themselves, for some reason the crew of DS9 get involved. ‘Armageddon Sky’ has two settings – musing and action. You flip from talking about honour and then an action set piece, back and forth. The problem with this is the honour bits are boring and you don’t really mind if the aliens are doomed, they want to be. It also seems very odd that Captain Sisko would seemingly empty out his entire Space Station of experiences personnel. The difference between DS9 and say Next Gen was that the crew were in a static environment. Danger coming to them is one thing, but heading out to it is another. There is no explanation why Sisko would put in danger so many major officers. Leave most behind and as the Captain you should stay with your station. I like a Star Trek tie in novel, but when reading them you have to be prepared for a very varied standard. ‘Armageddon Sky’ falls into the weaker category. A daft idea with daft Klingons, with Sisko putting in danger a daft number of high value crew members. A better story would have allowed you to suspend your disbelief, this is Trek after all, but the weak motive of the Klingon sense of “Honor” means that all the problems glare. Slow-paced beginning, but gets to some great payoffs in the last third. Really liked how situations were used that wouldn't work in television. And the fauna of the planet "Armageddon" was stunning, especially the "xerry"
(don't have the book at my side, spelling may be incorrect). better than this tidbit implies. So far (two books to go) the best of the "Day of H Slow-paced beginning, but gets to some great payoffs in the last third. Recommends it for: Star Trek Fans and Klingons. Love this series! Found all 4 books in the series at a shop called "Book Celler"! I actually read this one and the first book in the series in the same day. I couldn't put them down! This is the second book of a short series exploring the idea of Klingon Honour. This story is set in the world of Deep Space Nine, where Sisko and his team are called to rescue a ship of veteran's from Klingon attack. Tracing the survivors to a planet being bombarded with asteroids, they also find the remnants of a Klongon colony. One left to die there for dishonouring the empire. Struggling to find the survivors, escape the impacts and ward of the Cardassians, they are in for a tough mission. I This is the second book of a short series exploring the idea of Klingon Honour. This story is set in the world of Deep Space Nine, where Sisko and his team are called to rescue a ship of veteran's from Klingon attack. Tracing the survivors to a planet being bombarded with asteroids, they also find the remnants of a Klongon colony. One left to die there for dishonouring the empire. Struggling to find the survivors, escape the impacts and ward of the Cardassians, they are in for a tough mission. The Defiant goes to rescue a downed science research vessel. The planet it lands on is full of Klingon exiles, and the Klingons do not want the Federation anywhere near it. This would have made a good TV episode. The plot is very engaging, and the Klingons are depicted very well. I particularly liked the descriptions of the planet and its inhabitants. Surprisingly, it is more of an ensemble piece, even though Worf is on the cover of the book. A good read. This was quite enjoyable, lacking some of the stiffness of the first TNG novel. Odd, to see so much Klingon in a DS9 environment, although in fairness Kira comes through with her usual Bajoran aplomb.